Native Swimming, Wave Mechanics and Surfboards, 1867. .Pages 44, 193, 194, 264 to 269. Charles Steedman was a English swimming champion who later emmigrated to Australia (1854) where he continued his competitive swimming in Victoria. “A small deal (pine of fir) board, about five feet long, one foot broad, and an inch thick, termed a ‘surf board,'...”. - page 286. This is a substantial board, similar to dimensions reported in Tahiti and Hawaii in the nineteenth century. -for by its aid he can raise his head to breathe above the surface of the foam." Certainly the preceding paragraphs on Body surfing (pages 266-268, below) are confusing and appear to be instructions on how to avoid the wave, rather than catch it. Polynesian surfboard riding, and remains, at present, an historical anomaly. Steedman's report of a fatal experiment in Paris, indicates an early model of what eventually became known in Australia as the surfoplane, circa 1932, and was subsequently replicated around the world as the rubber surf-mat. The account clearly records the overarm style associated with the Polynesian (sometimes, Australian or American) Crawl. The kicking technique is not discussed. Given the less than explicit account by Steedman of body surfing and surfboards, below, the following (heavily edited passage) stongly suggests these north coast aborigines had at least established the basic rudiments of body surfing. "... a party of aborigines will run to meet the breakers. Extended in a line, they will stand to meet the incoming of the small seas, and will perform the most amusing feats, as the force of the breakers drives them back to the shore. On the approach of a large wave ... as the sea bursts over them; ... the blacks ..., will rise on the crest, and continue to go through their eccentric and amusing evolutions as usual." Harzards of Testing Life Saving Apparatus : Air Mattress circa 1865. The stereotyped verdict of; "found drowned," which one so often comes across in the daily papers, should in a large number of instances be changed into "death caused by a most important feature in the physical education of the victim having been completely ignored, namely, the 'art of swimming.'" Life-belts, life-preservers, life-buoys, and air-mattresses, air-pillows, &c., as means of assisting in preserving from a death by drowning, are, no doubt, valuable in their way, but their inferiority as safeguards to the legitimate method of sustaining the body in the water by swimming can not be better illustrated than by the fact, that not long since, in Paris, the inventor of a patent air-mattress was actually drowned, together with his assistant, through the mismanagement in some way of a specimen of his artificial life-preserving apparatus which he was exhibiting in public. VII. TO SWIM AFTER THE MANNER OF THE NORTH AMERICAN INDIANS. -The stroke used by the Mandans, as well as by most of the other tribes in North America, is quite different from that usually practised in the civilised world. ...taneously in front of the head, and making the stroke outward in a nearly horizontal direction, thus causing a rather severe strain upon the chest, throws his body alternately upon the left and the right side, raising one arm entirely above the water, and reaching as far forward as he can to dip it, whilst his whole weight and force are spent upon the one that is passing under him; which, Iike a paddle, is propelling him along; whilst this arm is making a haIf-circle, and is being raised out of the water behind him, the opposite arm is describing a similar arc in the air over his head, to be dipped in the water as far as he can reach before him, the hand bent inwards so as to form a sort of cup, and thus act most effectively as it passes in its turn underneath him. In tbis bold powerful mode of Swimming, which may certainly be defficient in the grace which many wish to see, there is little strain upon the breast and spine. This mode enables the smimmer get through the water more speedily than the breast stroke does. It is, however, less rapid than the side stroke and more fatiguing than either breast or side stroke. Australian Aboriginal Swimming and Body Surfing (?). This writer, however, must admit that he never saw a blackfellow (Australian aborigine) in the water who could not swim; still he thinks it highly probable that, in some parts of the intefior, where the streams are small and water scare, Swimming may be an unkrlown art among the tribes inhabiting those districts. The dwellers along the coast-line are generally good swimmers. Many of them assist in stowing discharging cargo. They wait for their work in the water, swimming in the tracks of the boats. Steamers going up the Mary river invariably pick up a few black labourers. On the return trip, off Frazer's Island, the natives drop into the water, with their wages in kind on their backs, and make for land. It is a considerable distance to the island and the ocean current runs strong between it and the mainland. Their posture in swimming is nearly upright, hence their general progress through the water is anything but rapid. But when they desire to increase their speed to reach any object, their body becomes nearly horizontal. aborigines (confirmed by that of a relative who has spent many years amoung them in the far North), is that they have to learn to swim, as well as white men. More than this, when they have learned, necessity appears to be the only thing that induces them to enter the water alone, though with white men a blackfellow becomes as willing as a water-spaniel, and nothing seems to give him more pleasure than a "bogie" , i.e. swim (pronounced bo'ge ???) on the sea-coast. Encouraged by white men, and accompanied by them, hand in hand, leaping and shouting, a party of aborigines will run to meet the breakers. On the approach of a large wave the white man will usually dive and work their hands into the sand, so to obtain a firm hold as the sea bursts over them; while the blacks on the contrary, will rise on the crest, and continue to go through their eccentric and amusing evolutions as usual. if not surpassed, by picked swimmers from among the whites. In fact the writer has no faith in the superior powers of what has been termed the "noble savage." When swimming on an open sea-coast, after a gale has blown in the direction of the land, a little care is necessary to avoid having the breath beaten out of the body by the perpendicular descent of the breakers. The swimmer will rise and fall with each wave, as it sweeps past, unless he should happen to be immediately inshore of one when it commences to break; then, the lifting power of the wave, or rather all that portion of it which is "curled," is destroyed, and the pressure is downwards. Anyone who has experienced this falling weight of water while bathing on a sea-coast where there is a long "fetch," can testify to its crushing effects. hole, as it were, for his reception. At one moment, his legs and arms will be as violently twisted as if he were being spun into a rope; and then as suddendly, he will find himself as compactly coiled up into a ball as a hedgehog in an attitude of defence. The way to avoid this rough usage is to wait and watch for the curling of the water overhead, then instantly, before it has time to break, to make a vigorous stroke right through the wave, when it wiII break harmlessly inshore. The reason why swimmers rise and fall, without effort, with each wave, so long as it remains unbroken, without being carried along with it, is owing to the fact that the water forming the wave does not advance horizontally, but simply moves upwards and downwards; and that all bodies suspended in the water, and of nearly the same specific gravity, are affected in their on-ward motion solely by the movement of the medium in which they are immersed. Advantage is taken of' this property to determine the rate at which a vessel is moving through the water by the heaving of the "log." ... water is driven forward by the wind and the momentum of the waves. Hence the water forming waves not advancing, neither does the swimmer who allows himself to be controIled by its motion make any onward progress. Breakers are caused in the following manner. The motion of the wave being suddenly arrested on its striking the shore, the direction of its momentum is changed from the horizontal to the vertical. Again, the water forming the wave meeting with the passive resistance of the non- yielding and non-elastic beach, and also being pressed in its rear by the succeeding roll with a force equal to its own, rises upwards till its accumulated force is spent. Then the water, descending by its own weight, produces the disturbance and foam so harassing to the swimmer who gets caught in a heavy surf. A small deal (1) board, about five feet long, one foot broad, and an inch thick, termed a "surf board," is of considerable help to a swimmer who is crossing water on which the foam is deep -for by its aid he can raise his head to breathe above the surface of the foam. Dr. Scoresby stated in a communication to the British Association, in 1850, that during several hard gales he had measured many waves of about thirty feet, but the highest was forty-three feet from the hollow to the crest. A block of stone, of flfty tons weight, was moved by the sea at Barrahead (one of the Hebrides); and, what is more exta-ordinary, blocks of six tons weight have been quarried, or broken out of their beds 'in situ' on the top of the Bound Skerry of Whallsey, in Zetland, elevated seventy feet above the highwater spring tides. The Bound Skerry and other rocks in the German Ocean certainly furnish by far the most wonderful proof that has yet been discovered of the great force which is developed by the billows of the ocean when suddenly checked by opposing rocks. THOMAS ST. VENSON, C.E., "On Harbours". 1. "deal (2) n. 1. a board or plank, esp. of fir or pine." Macquarie Dictionary (1991), page 458. The sixth anniversary of the Victoria Swimming Club was celebrated on Saturday afternoon by a number of matches at the Sandridge Baths, and as the weather was beautifully fine, there was a very good attendance. A brass band was engaged for the occasion, and the arrangements made for the convenience of the public was most effective. The first event was a 100 yards' match for boys under twelve years of age. A race for a distance of 200 yards, open to all who had never won an advertised prize,next followed, for which there were eighteen entries. In the first heat Salmon came in first and Underwood second, and in the second heat Gould was first and Rowan second. After an interval Salmon, Rowan, and Gould swam the concluding heat, when Salmon becarne the winner of the prize (a silver medal) Rowan coming in about three yards behind him. Four were entered for the third lace of 500 yards, but only three started. A good start was effected, and the first hundred yards done at a rattling pace, M'Kinlay being first, Murdoch second, and Williams third. This order, however, was soon altered, and at the end of the third hundred yards Williams occupied the first place, which he kept until the conclusion of the race. There were seven entries for the Champion Steeple-chase (C Steedman, the champion swimmer of Victoria, being one of the competitors), but only four started. The course was across the bath over a floating spar and a raft, and on reaching the fence on the other side the swimmer was required to plunge from an elevation of about five feet and then to swim back to the point from whence he started. This performance had to be repeated. Steedman, who was the last to enter the water at the start, was the first over the spar, and continued first the whole of the race, winning easily by about thirty yards. Ten boys started in a diving match for objects at the bottom of the water. This feat was accomplished by both Landor and Pickup, who recovered a small lead sinker, about the size of a walnut, which had been thrown in fourteen feet of water. The diving match for distance was won by Hughes, who dived forty-eight yards, and remained under water exactly a minute. There were seven entries for the plunging match, the prize for which was carried off by Steedman, who plunged a distance of fifty-eight feet. The wrestllng match in deep water excited a good deal of interest among the spectators. Two men get into deep water, and at a given signal the right hand of each is placed upon his opponent's head, when he who first presses the other under water becomes the winner. engaged, when the former won. Miller and Tullidge were the third couple, the former being the victor. The wrestle between Miller and Underwood was won by Miller. The next event was the Champion Match, for floating and evolutions m the water, for which there were four entries. Steedman first went into the water, and performed a number of very clever feats, on witnessing which the others, who had previously intended to compete, declined to do so; Steedman, therefore, retains the championship for another year. The Manxman's Match, in which each who enters has his leg and hand bound to that of another, thus giving the appearance of swimming with three legs, was won by Murdoch and Pickup, who came in about four yards in advance of the second couple. three close contests, Buchanan was proclaimed the victor. Several Years Champion Swimmer of England and Victoria. Geoff Cater (2006) : Charles Steedman : Manual of Swimming, 1867. "Charles Steedman was an English swimming champion who migrated to Melbourne during the gold-rush, arriving in July 1854. He took part in swimming competitions in the colonies and became the Australian champion. When he wrote this book he was the proprietor of the Railway Baths at Sandridge (Port Melbourne)." Sport Australia HaIl-of-Fame Awards, 2006. "SwImming's second inductee was the lesser known of the two and his award was granted posthumously. Charles Steedman was England's very fIrst International Swimming Champion and later Champion of Victoria, Australia. Prior to leaving for Australia in 1854, Steedman became Champion of England, the leading swimming country in the world during the middle years of the 19th century. His arrival in Australia caused considerable interest, where by he shared England's more advanced knowledge of the sport with his new country men. He became Champion of Victoria. In January 1858, aged 28 years, Steedman competed in the first World Swimming Championships held at Captain Kenney's ship baths at St Kilda. The race held over 100 yards was won by Jon Bennett of Sydney. Steedman's knowledge and swimming techniques were in fact better than his swimming race performances. It was in 1867, that he published 'A Manual of Swimming' being the author of the first technical book on speed swimming -first to define stream lining in swimming terms and first to refer to the "crawl" within a swimming discourse. Charles Steedman was the first notable contributor to the development of competitive swimming as a recognized sport, and his work set the stage for the beginning of the modem era of swimming in the 19th century. In recognition of his outstanding contribution, he was inducted into the lntemational Swimming Hall of Farne, Fort LauderdaIe USA in the year 2000, .-100 years after his death. Now 105 years after his death, Charles has been inducted into the Sport Australia HalI-of-Farne. As SAL has not been able to find any living relative of Charles Steedman, his certificate of induction will be placed in a position of honour in the SAL Canberra office. SAL is very grateful to our unofficial historian, Stuart Alldritt, who provided us with his research on Charles." 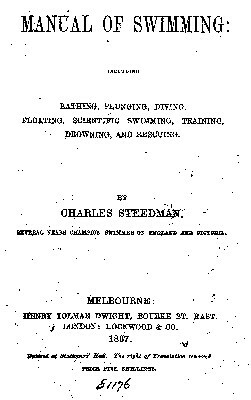 In 1867, when Charles Steedman's Manual of Swimming was published in Melbourne, it marked the beginning of swimming's modern era. Steedman's 270 page work contained the first descriptions of racing strokes and how to train. Unlike earlier works on swimming, this book was written by a champion swimmer, able to speak with the authority of practical experience. It was the first major technical contribution to the new sport of 'speed swimming', and a London edition six years later made it internationally popular. Because Steedman's book was based on practical experience, details of his swimming career are noteworthy. He was champion of England in the early 1850s when England was the world's leading swimming country. He was self-educated and excelled at everything he set out to do. At the age of 11 he began as a mapmaker, coloring maps. Two years later, he was a chemist's assistant. At 14, he apprenticed to a cabinetmaker and attended evening classes to learn grammar and mathematics. At 19, he became a piano-maker, where his newfound knowledge of mathematics enabled accurate measuring and fitting of the spruce sound board. Steedman only learned to swim at the age of 13, but his talent was such that by 1845, at the age of 15, he was a professional swimmer who had already won the then princely sum of £10 in a race over 400yds, the longest racing distance in those days. At 19, he won the championship of England from G Pewters, a master of the sidestroke, the new racing style of the day. Competitions were infrequent in those days because most races were staged encounters between two matched opponents. Although a professional swimmer, Steedman had a full-time job and could only train after an arduous 10 hour working day. Nevertheless, in 1852 and again in 1853, he beat Frederick Beckwith, nine years his senior, for the Surrey Club Championship, the event commonly regarded as the Championship of England. Beckwith declined to swim against Steedman again. Steedman immigrated to Australia in July 1854 'to see something of the world', and arrived two months later in Port Phillip Bay after a voyage attended by hardship, discomfort, and danger. Most of the time was spent in the latitudes of the 'roaring forties' where the waves were terrifying and said to be the highest in the world. In congested conditions, Steedman spent many weeks at sea. Steedman's arrival in Australia caused considerable interest among local swimmers because he was the swimming champion of England. He became swimming's first internationalist when he shared England's more advanced knowledge of the sport with his new countrymen. Practical by nature, Steedman thought it important to have a full time job, and soon he was earning his living as a skilled piano maker. Always seeking to advance himself, he learned Latin and Greek, and became a schoolmaster as well as a journalist. He became champion of Victoria, and there published the first book on speed swimming. As a respected member of the new Melbourne colony, his book was well received. 'Manual of Swimming' (1867) was the world's first technical book on 'speed swimming' and marked the beginning of swimming's modern era. As swimming's first internationalist, Steedman's 'Manual', as it was colloquially referred to, became the world's first reference to bathing, plunging, diving, floating, scientific swimming, training, drowning and rescuing written by an accomplished swimmer using available sound, scientific methods of the day to authenticate his beliefs. In the introduction of the book, Steedman said that there was 'no comprehensive book in English' on the subject of swimming. He mentioned the fact he had 'attained the honorable position of champion swimmer both in England and Australia, and had maintained that position for several years' and 'was sufficient guarantee' of his 'knowledge and mastery of the subject' that he undertook to teach. Steedman wrote, 'The ability to write well and to swim well are two distinct qualifications, which appear never to have been combined in one individual in an eminent degree. Large sections of the 'Manual' are devoted to the need to bathe regularly, and how to rescue drowning people. This was because few people at that time washed, and few people could swim. It was obvious to Steedman that, before people could be encouraged to learn to swim and become safe in water, they had to be encouraged to like water. Steedman mentioned the high rate of drowning, and how the skilled swimmers of the day each saved a large number of people from drowning. Steedman, had 66 saved lives to his credit. As a scientist, he used mathematics as a means to derive better speed results. He describes the North American Indians as swimming with an alternative continuous arm action which was a type of crawl stroke, predating a subsequent reference by at least 30 years. 'Crawl' was the 19th Century term used to describe the dog paddle, as we know it today." Privately Printed at the Riverside Press, 1912, 1912. Hard Cover. First. Limited to 100 copies.